I'm looking for some help! I'm currently at University, and I'm doing research for an essay about how free reed instruments work. 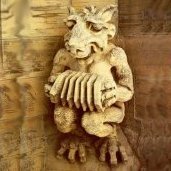 I was wondering if anyone could help me to understand the physics behind the concertina. I'm a player myself, but I've no idea what goes on in the inside. I've heard that there is a substantial amount of general reed design information at Hohner, but they keep that information very close. Possibly the most comprehensive and most (relatively!!!) available works are Gotthard Richter's books Akkordeon - Handbuch fur Musiker und Instrumentenbauer of 1990, mainly on construction techniques, methods and various acoustical lab tests, and Akustische probleme bei Akkordeons und Mundharmonika 1985 in 2 parts with similar studies. There are also some Russian articles (about 50 years ago) by B.P. Kostantinov and a few alleged Polish tech technical studies which I know nothing about. All the above are accordion-centric and in languages I can't decipher. I never been able to obtain copies of any of them. But you CAN easily get Fundamentals of Musical Acoustics by Arthur Benade (yay Dover!) which gives only passing reference to free-reeds but goes into depth on vibrating plate dynamics from which you can extrapolate a lot that pertains to free-reeds. Just reading though this book will give you a great base from which to understand the other more technical articles by other people. The only other significant and well-documented investigations into free reeds (though it's harmonium centric) English information I know of comes from James Cottingham. I say "know of" as I've tried several times to contact him (by phone and e-mail) and have yet to receive any response. I know of two other people who have also tried to contact him who've not received responses either. You can access some summaries of a few of his papers from his web page, and view his entire articles through the Acoustical Society of America Information web site. Unfortunately much of their stuff in not on-line, but you can find out which volumes of their Journals the articles are in and then find them at a Library. I was pleasantly surprised to be able to access all of them at our local University library! While all this stuff is quite technical, some of us here can give you a simpler version of how/why reeds work, but even that is pretty involved. You can start by reading through articles by Dana Johnson right here on Concertina.net under the "Buyer's Guide" section. Cut a harmonica in half. Put a bellows between the two halves. Add a valve over each reed hole that can be opened and closed with a fingertip. Viola. (non-technical version). But ani didn't ask about how a viola works. She(?) asked about a concertina. Careful with the quips, David, or we may start making jokes about your own viola-on-steroids. While Jim is no doubt referring to my 'Cello, does anybody have any idea what this thing is? I just returned from a week's vacation in Belgium and saw instruments like this in two museums (the Musical Instrument Museum in Brussels and the Gruuthuis in Brugge). Neither provided much of an explanation, but there was a reference at the Gruuthuis to internal bellows and reeds. I'm not even certain that this is the instrument they were referring to, however. 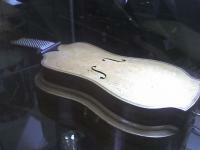 The body is a little smaller than a Cello but bigger than a Guitar. It does not have any strings and those bumps on the fingerboard look like little metal rollers (like the metal wheels of old roller skates or loading dock conveyors). The body is a little smaller than a Cello but bigger than a Guitar. Until you mentioned the size I was thinking it could be Pablo Casals coffin. ... But I really have no idea. Speaking of cellos and the like, are you familiar with Gordon Bok's "cellamba"? Sure! It's a melophone (sometimes misspelled "mellophone). Invented about 1837 by Leclerc of Paris. The photo you have shows the cover. Take it off to get to the interesting stuff. Here's a photo of what you'd then find. The 4x8 sea of keys on the neck are connected by wires, brass levers, to pads that allow the reeds beneath them to speak. Air is supplied by a double action bellows concealed within the instrument and actuated by a piston working through the lower end of the case. Beneath the neck is a lever acting as an octave coupler. Regondi is supposed to have performed on these guys. Googling around brought up a bunch more information and photos of them. That Taxonomy site has it listed and there's one on display at the Le Carrefour mondial de l’accordéon Museum. ...does anybody have any idea what this thing is? Sure! It's a melophone (sometimes misspelled "mellophone). Invented about 1837 by Leclerc of Paris. Regondi is supposed to have performed on these guys. 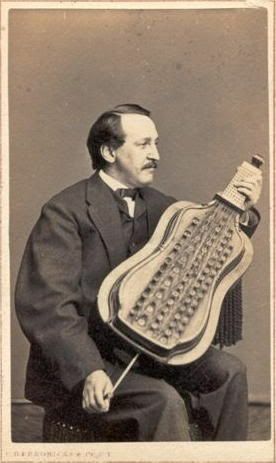 My understanding is that Regondi did not perform on the melophone, but that his English concertina was (mis)identified as a "melophone" in some of the reports of his German tour, presumably because the German audiences were familiar with the melophone was a free reed instrument, but would not have had any idea what the name "concertina" referred to. Stephen C. and others who know more than I do, can you tell us which is right? Correct Jim, Douglas Rogers and myself spent several years struggling with that topic before we got the material to debunk the "Regondi played the mélophone" myth. Indeed that name continued to be used for the English concertina, at least in Germany & Hungary, into the twntieth century. And as we've discussed previously, the German concertina was originally called "a new kind of accordion" by Uhlig, its inventor. It is terribly complicated and confusing, but many free reed instruments bore different names (often that of another instrument) to those that became accepted later, or those we know them by today, and it's still changing. Yes. I've seen him play it several times. The guy who was my Cello teacher when I was in high school played something similar, but he called it a Viola da Gamba. As this was my first exposure to an instrument by this name, it was years before I realized that there was a difference. He was an old-school German fellow, a former member of the New York Philharmonic. His instrument had a modern, streamlined look to it. It was strung with steel strings and had no frets. It had an end pin. He played it with a cello bow (which he held like a cellist) and used considerable vibrato. Any idea what position it was held in while being played? Up like a Cello or down like a table instrument? My guess is up. 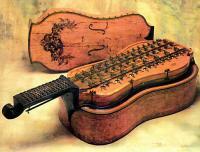 However there was also a larger, later version called the cecilium which was played upright like a cello. Edited to add note about Donniker. Just a reminder, there is a mélophone in the Horniman's free reed display. By coincidence I was there this morning - in the area and could not resist calling-in. The lighting is appalling and I find it difficult to see clearly with my aging eyes, but I did notice that exhibit 97 - a very respectable Jeffries 51 Key anglo - is described as a " Jacob's concertina biscuit tin with free reeds" . I am both puzzled and tempted... should I take along a genuine biscuit tin for an exchange??? Just a reminder, there is a mélophone in the Horniman's free reed display. By coincidence I was there this morning ... exhibit 97 - a very respectable Jeffries 51 Key anglo - is described as a " Jacob's concertina biscuit tin with free reeds" . I am both puzzled and tempted... should I take along a genuine biscuit tin for an exchange??? I think you will find that they have one already, though it may be labelled as a "Jeffries 51-key anglo" ? but I did notice that exhibit 97 - a very respectable Jeffries 51 Key anglo - is described as a " Jacob's concertina biscuit tin with free reeds" . I am both puzzled and tempted... should I take along a genuine biscuit tin for an exchange??? Only if you remember to take along the reeds as well, free would be OK, but I think they prefer more expensive ones ... ahem. I wonder what she must think of us! Not really Chris, in a subtle way I am advising her that should she, in the lines of her research, decide to visit the free reed display at the Horniman museum, then a torch (flashlight) and opera glasses are essential - especially in looking for the biscuit tin.